It never occurred to me back in my school days, but I can bet quite a few math students with smartphones have wished at one point or another that their phone could just give them the answer and get it over with. 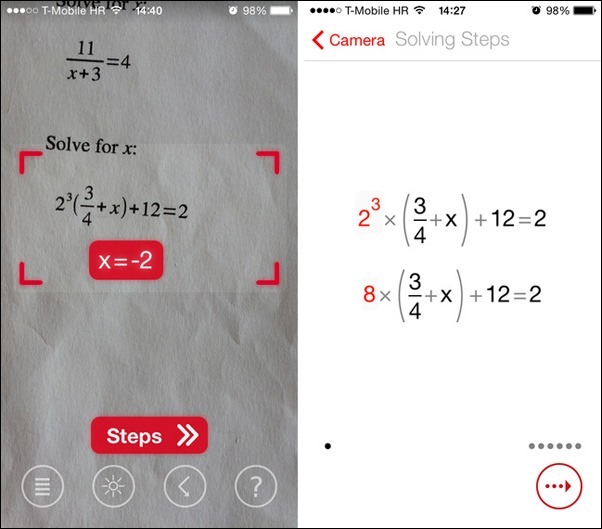 Enter – PhotoMath, the iOS app that scans your printed mathematical equations and solves them for you. We’ve come across a bunch of apps that aid in solving complex mathematical equations, but this dream of an app cuts away with manual input that may be otherwise required in most offerings. Run the app, point the camera at the equation and voila! Now you know what that ‘x‘ is actually equal to. 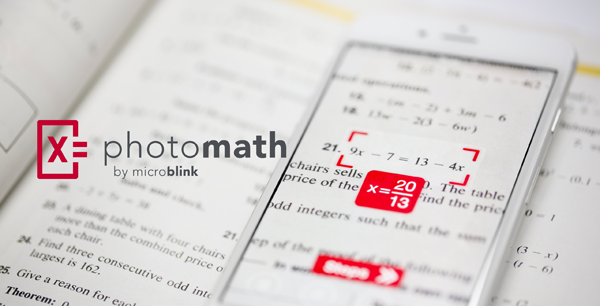 Using OCR to grab the equation from the printed material, PhotoMath is not to be misunderstood for a quick cheat code for all those take home quizzes or assignments. The app takes you through all the required steps needed to solve the equation, making sure that you actually learn something out of it as well, and not just fill in some answer box. Picking up the equation from the printed material, the app will consequently determine the type of equation that is in question. Pointing the camera lens at the equation, you will need to move your muscles a bit to place what you want solved in that red magical frame. Once the app determines what it’s dealing with, it will take you step-by-step up till the actual answer. However, the dream-come-true app does have its quirks. 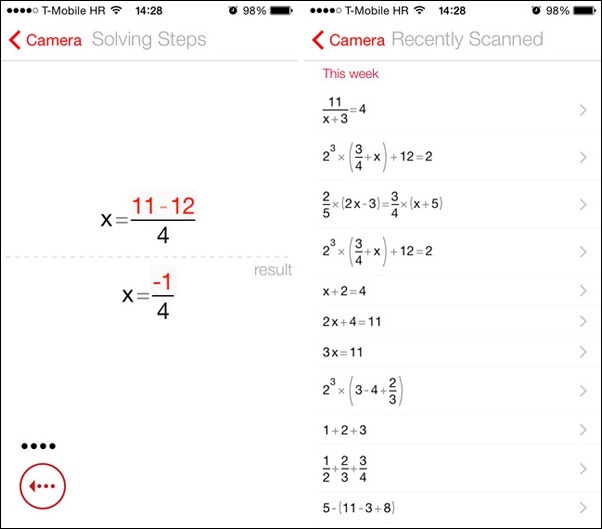 Solving algebraic expressions, the app will often mistake an ‘x‘ variable for the multiplication symbol. As for framing an equation in place, it has its limitations in that lengthier equations are hard to place within the frame. Currently PhotoMath will solve all equations based on basic arithmetic, fractions, decimal numbers, linear equations, and several functions like logarithms. According to the creators, further support for more equations and support for complex equations will also be added through updates. In my opinion, the app barely escaped from being regarded as cheat tool to being a learning tool all because of its ability to provide a step-by-step guide to solving equations. In no way a tutor replacement, PhotoMath will at least give students the ability to kick start their problem solving cells in the right direction. The app is absolutely free and can be downloaded from the link embedded below. Anyone remember an episode of The Big Bang Theory where they make such an app?